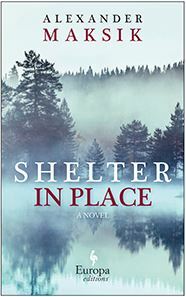 Set in the Pacific Northwest in the jittery, jacked-up early 1990s, Shelter in Place, by one of America’s most thrillingly defiant contemporary authors, is a stylish literary novel about the hereditary nature of mental illness, the fleeting intensity of youth, the obligations of family, and the dramatic consequences of love. Joseph March, a twenty-one-year-old working class kid from Seattle, has just graduated from college and his future beckons, unencumbered, limitless, magnificent. Joe’s life implodes when he starts to suffer the symptoms of bipolar disorder, and, not long after, his mother, Anne-Marie March, beats a stranger to death with a hammer. Joe moves to White Pine, Washington, where Anne-Marie is serving time and his father has set up house. He is followed by Tess Wolff, a fiercely independent woman with whom he is in love. Meanwhile, Joe’s mother is gradually being transformed into a national heroine. Many see her crime as a furious, exasperated act of righteous rebellion. Tess, too, is under her spell. Spurred on by Anne-Marie’s example, she enlists Joe in a secret, violent plan that will forever change their lives. Maksik sings of modern America’s battered soul and of the lacerating emotions that make us human. Magnetic and masterfully told, Shelter in Place is about the things we are willing to die for, and those we’re willing to kill for.